Wilfholme Landing is a minor waterways place minor waterways place place on the waterways major waterways place village town city on the River Hull (Main Line) between Struncheon Hill Locks Nos 6 and 7 (Junction with River Hull) (2 miles and 5¼ furlongs to the northeast) and Aike Beck Junction (Aike Beck used to join here) (1 mile and 2 furlongs to the southwest). The nearest place in the direction of Struncheon Hill Locks Nos 6 and 7 is Wilfholme Beck (Tributary of the Hull (un-navigable)); 1¼ furlongs away. The nearest place in the direction of Aike Beck Junction is Linley Hill (Airfield EGNY close by); 4¼ furlongs away. A small collection of boats moor here. The only other thing of note is the pumping station just out of shot to the right. 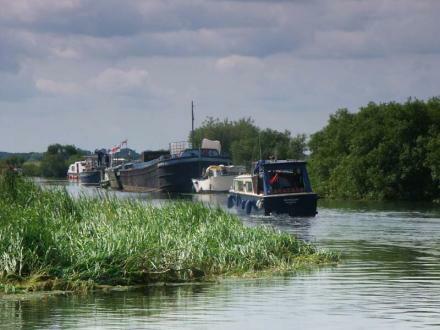 Wilfholme Landing is located on the Driffield Navigation in the East Riding of Yorkshire, England. The navigation is still tidal at this point, and is often considered to still be the River Hull, although technically the Navigation starts at the point where the Aike Beck used to join the river, a little further downstream. It is 0.9 miles (1.4 km) from the hamlet of Wilfholme, and its main features are boat moorings, a farm and a pumping station. It is a popular spot for fishing, with anglers targeting resident roach, bream and perch. Beverley Airfield, Beverley, HU17 5LT — 1400 yards to the southeast. Three Jolly Tars Farm, Driffield, YO25 9BQ — 483 yards to the northwest. Three Jolly Tars Farm Wilfholme, Driffield, YO25 9BQ — 85 yards to the northwest. 12 yards to the south.